Via Geoff Shackleford by way of the Belfast Telegraph comes news that we will not see Rory McIlroy wearing his familiar Nike swoosh this summer at the 2016 Olympics in Rio. Instead, McIlroy will wear New Balance, who stepped up when Nike opted not to back the Irish Olympic team. Olympic team outfitters have caused similar kerfuffles in the past, most notably for Michael Jordan and Charles Barkley in 1992 when Reebok trumped Nike as Team USA's apparel provider. To show allegiance to their brands, His Airness and The Round Mound draped American flags over the offending logos during medal presentations. Could Rory go rogue in Rio? 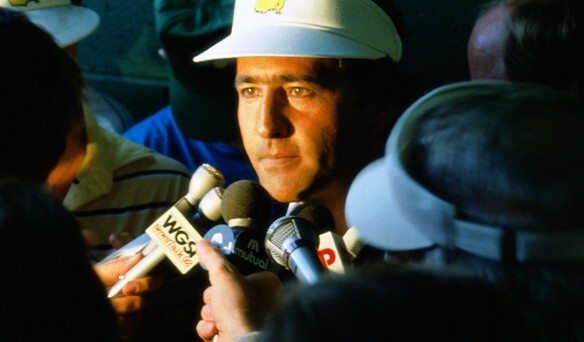 If he does, perhaps he takes a cue from a savvy Seve sponsorship steward at the 1986 Masters, who doubled down with patchwork craftiness to turn the Masters visor he wore for Saturday's round into an impromptu billboard for Sunday. Don't forget to pack your glue gun Rory.